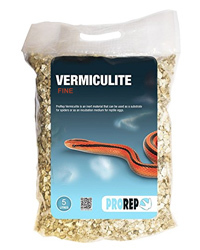 ProRep Vermiculite can be used as a substrate for spiders or as an incubation medium for reptile eggs. A 100% natural substrate made from exfoliated volcanic rock, it is inert and will not decay or go mouldy. Directions: Place the required amount of Vermiculite in a clean container. Add cold water a little at a time until the correct moisture content is reached. For use with spiders, place a 1-2" (2.5-5cm) layer of moistened Vermiculite in the bottom of the tank. This substrates is not recommended for burrowing species as it does not form burrows easily - for these species use Spider Life Substrate. Spot-clean regularly and change completely every 4 weeks, or sooner if required. For use as an incubation medium place a thick layer of moistened Vermiculite in the incubation box. A moisture ratio of 2:1 Vermiculite to water by weight is suitable for many species but some species have different requirements. Carefully place the eggs in the Vermiculite with the top third of the egg exposed. When moving the eggs from the egg laying site to the Vermiculite take care to keep them the same way up. If possible ensure that the eggs do not touch each other during incubation. Please note that as incubation of reptile eggs is a complex process that varies from species to species, it is essential that you research the details for each species before eggs are laid and have a suitable incubator ready.